Home › God › Do you know God’s Name? In Biblical times, your name was your sole identity. In most instances, a special meaning was given to a name. Names had an explanatory purpose. In Holy Scripture God reveals Himself and Who He is to us through His names. When we study these names that He reveals to us in the Bible, we better understand who God really is. The meanings behind God’s names reveal His personality and nature. He is our Most High God, the All sufficient One, our Master, the Lord of Peace, the Lord Who Will Provide. He is our Father. God is not an “it” or a “thing” to which we pray. He is our Jehovah Raah, the Lord our Shepherd. Our heavenly Father knows each one of us individually by name, we should know Him by His. To hallowed name of God is to be regarded with complete devotion and loving admiration. God’s name is of the utmost importance. We should hold it in the highest esteem and treasure it in a position of grave importance in our minds and hearts. We should never take His name lightly. We should always rejoice in His name and think, pray and meditate deeply upon its true meaning. 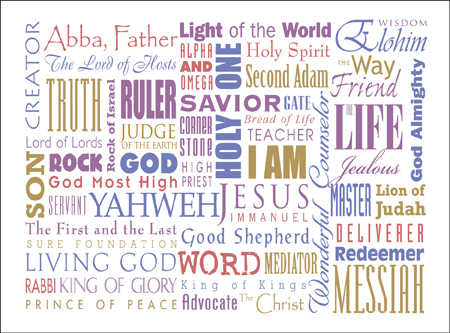 Below are some of the names of God in His Word. EL: Definition- God (“mighty, strong, prominent”) It is used 250 times in the Old Testament, and is linguistically equivalent to the Muslim “Allah,” but the attributes of Allah in Islam and the Quran are different from those of God in the Bible. ELOHIM: Definition- God Elohim It occurs 2,570 times in the OT. It is used for God as Creator, Preserver, Transcendent, Mighty and Strong. ADONAI: Definition- Lord in our English Bibles. Adonai is plural, the singular word is “adon”. Adonai is translated as “Master” or “Lord” 300 times in the OT and is always plural when referring to God, when singular the reference is to a human lord. The word adon is used 215 times to refer to men. JAHWEH (JEHOVAH): Definition- LORD in our English Bibles, and is spelled with all capitals. Yahweh is the covenant name of God. It occurs 6823 times in the OT. It comes from the verb “to be”, havah, similar to chavah (to live). It means “The Self-Existent One,” “I AM WHO I AM” or ‘I WILL BE WHO I WILL BE” as revealed to Moses at the burning bush. The name of God is too sacred to the Hebrews to be uttered, abbreviated or written “YHWH” without vowel points. Jehovah and Elohim are both used to indicate one God with a plurality of persons. JEHOVAH-JIREH: Definition- “The Lord will Provide.” God always provides, adequate when the times come. JEHOVAH-ROPHE: Definition- “The Lord Who Heals”. This name implies spiritual, emotional as well as physical healing. God heals body, soul and spirit; all levels of man’s being. JEHOVAH-NISSI: Definition- “The Lord Our Banner.” This means God on the battlefield, from word which means “to glisten,” “to lift up. JEHOVAH-SHALOM: Definition- “The Lord Our Peace” “Shalom” translated “peace” 170 times means “whole,” “finished,” “fulfilled,” “perfected.” Shalom means that kind of peace that results from being a whole person in right relationship to God and to one’s fellow-man. JEHOVAH-TSIDKENU: Definition- “The Lord Our Righteousness” , This name means straight, stiff, balanced – as on scales – full weight, justice, right, righteous, declared innocent. God our Righteousness. JEHOVAH-SABAOTH: Definition- “The Lord of Hosts” The commander of the angelic host and the armies of God. KADOSH: Definition- “The Holy One” Isaiah uses the expression “the Holy One of Israel” 29 times. EL ROI: Definition- “God of Seeing” .The God Who opens our eyes. YESHUA: (Yeshua) Definition- “Savior” “He will save”. Jesus is the Greek equivalent of the Hebrew “Joshua.” The latter is a contraction of Je-Hoshua.,”Christ”, the anointed one is equivalent to the Hebrew Maschiah, or Messiah. GAOL: Definition- “Redeemer” This name means to buy back by paying a price. IMMANUEL, or EMMANUEL, or IMANUEL: Definition- “God with us” This is in reference to Jesus Christ our Lord. Malachi called the Messiah “The Sun of Righteousness”, and Isaiah called the Messiah “Wonderful, Counselor, Mighty God (El Gibhor), Everlasting Father, and Prince of Peace”. The LORD who revealed Himself as YHVH in the Old Testament is revealed as Yeshua (Jesus) in the New Testament. Jesus shares the same attributes as YHVH and clearly claims to be YHVH. In John 8:56-9, Jesus presents himself as the “I AM.” When challenged by some Jewish leaders regarding His claim of seeing Abraham who lived some 2000 years earlier, Jesus replied, “Truly, truly, I say to you, before Abraham was born, I AM.” Those Jewish leaders understood that Jesus was claiming to be YHVH. This is clearly established when they tried to stone Him to death for what they considered blasphemy under Jewish Law. In Romans 10:9, Paul declares, “if you confess with your mouth Yeshua as LORD… you shall be saved.” Immediately thereafter, in Romans 10:13, Paul backs up this declaration by quoting the Old Testament, “Whoever will call upon the name of the LORD (YHVH) will be saved” (Joel 2:32). Calling on Yeshua (Jesus) as Lord is the same as calling Him YHVH, because Yeshua (Jesus) is YHVH (LORD), the Messiah foretold throughout the entire Old Testament. It is of the utmost importance if we are to have a relationship with our Lord, we need to know Him! God wants us to know Him through His Son Jesus Christ. He wants us to know His name. He wants us to seek Him, and call upon His name. How many names he does have is utmost important, I alwsays like calling Him Jesus, but my second name to call Him is The Counselor! all are the ones for Him. Love You Darrell for putting these blogs here. All are great! I wish I had a web site. Money is the main reason. Thanks, Darrell. This is great information. God is referred to by so many names; knowing the distinctions between each is so valuable and helps bring me closer to Him. Bless you. Thank you Pastor Darrell for the good report on Apostle Ted Haggard & the special words of encouragement you give through your revelation as well as your relationship with our anly true Friend & Savior. May all those who seek find the blessing restored in their lives that our brother ( the disciple John spoke ). They ( the world ” unregenerate mankind ” ) shall know us to be true believers by the Love we have for one another. What a blessing to hear of the restoration of Pastor Ted & his family to the Fathers calling for it is truely as he wrote God is a restorer of the breaches we create through our lack of knowledge. Thank you Yeshua ah Messiah !!!!!! My precious wife & I have been interceeding for Apostle Ted , his family & the body of Christ as a whole across the globe. We shout Hallelujah !! Hallelujah !!! & Hallelujah !!!!!! even the more for all who are being restored to true Sonship. I myself cherish your prayers of support for my wife & I are going through the same process in the hand of the Father, believing to be restored to the call to Native American tribes. As Pastor Ted quoted ” truely the gifts & callings are fo no repentance we must not draw back because we desire the Fathers good pleasure. May the Body of Christ pray & support each member as they did in Acts C. 4 for each member should be fittly joined & supplying as they are able & led by the Holy Spirit. Jack & Ute Bishop Clyde ,NC. May I use your picture of the names of God at my ladies retreat?